Hi!! I have a quick post for today! I wanted to share a fall card I made last week. I don't know what it is about hanging things from trees or making them look like they are falling from trees (however you interpret it) but I LOVE to do that!! That little tiny acorn is from PTI's set "Autumn Acorns". Ok, this is such a sweet little set. I ADORE the fonts and sentiments in the set too (although I didn't use them here). So, can I share something personal with you? This has been an "emotional" week so far, mixed with the good and the bad. But, through it all, the voice of God has been there reminding me that He is here. That HE is in control. That I can trust Him. That I can lean on Him. That I can hope in Him. That reminds me of a song that I have had in my head all afternoon now and I just can't keep it to myself. So, if you would like to hear an uplifting message, click below! THANK YOU for stopping by!! Have a blessed and uplifting week full of the wonder of the Lord! I haven't posted for a while now about my Esty shop, Jen's Ink Spot...and that is because I have been so busy I haven't had time to update it! But, I did work on that today and I am excited to share with you some new designs! The button rings are made to order, so I make it to the size you need! Here are 3 new rings I just added! I'll start with my favorite of the group because I think it is so unique! When I first found this button, I fell in love!! It is very trendy and not unlike many of the expensive rings I've seen around lately! I bought the button and when I showed my husband he just gave me a look like I was crazy. :) Well, I think it is fun, trendy and sure to make a statement! The pictures really don't do it justice either. I love this series of rings!! I wear mine often! They are so fun! Such an easy way to accent your outfit!! I recently learned that you should most often have 7 pieces of jewelry on (earrings, watch, rings, necklaces, etc) to balance out your outfit! And, then I know I've shown these before, but I recently adjusted the price of them and wanted to share them again. I LOVE them too!! The following rings are adjustable rings so they are one-size fits all. I hope you enjoy them! You can see them in my Etsy shop here! Thank you for visiting! I hope you enjoyed the rings!! If you would like to take a look at the tons of other rings I have in my shop, just click here! Have a wonderful weekend!! The Twinery is participating in a Last Days of Summer Blog Hop and I created a few projects for their blog that I wanted to share with you today as well! You can see all eleven companies participating in the hop, including PSA Essentials which I've included on my cards, by visiting The Twinery's blog! Here is the trio of cards I made. You know me, I can't resist bright colors and these particular colors seemed to be calling my name (it is a SUMMER blog hop after all)! I featured a different color of The Twinery's twine and a different stamp from the PSA Essentials set "Rosettas" on each card. I kept the designs simple to showcase the twine and stamps. Lemondrop Twine ~ The circle on this card is actually a limish green but it looks yellow in the photo. 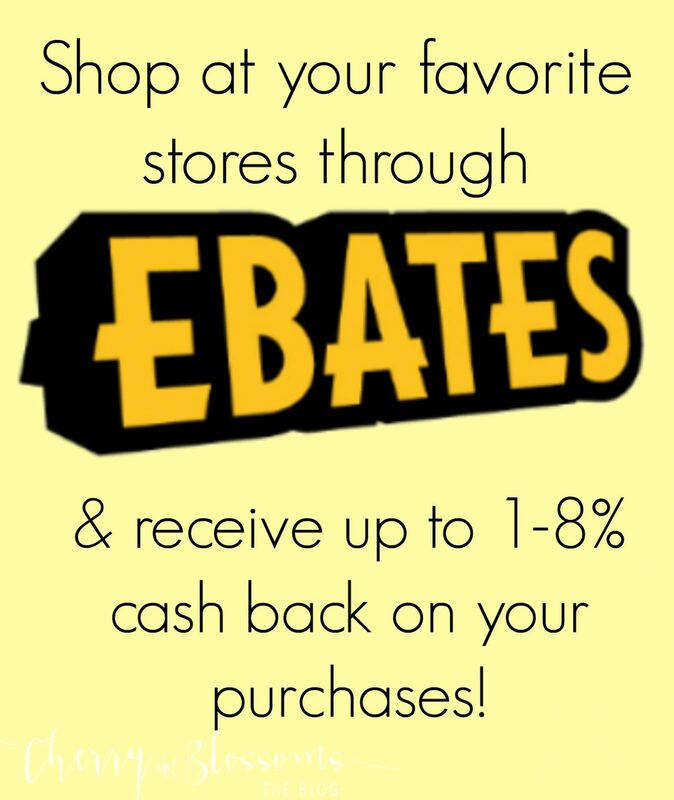 I hope you will be able to take the time to hop along with these companies!! You can start at The Twinery's blog! Thanks for visiting today! Have a wonderful weekend!! I took my inspiration from the colors, the flowers and from the suitcase lining. There were so many beautiful elements in this photo it was hard to narrow down what to focus on! I used Damask Designs to first stamp a background on Rustic Cream cardstock using Haystack Palette ink. The flowers were stamped with a mixture of Sweet Blush & Hibiscus Burst inks and then I used a yellow copic to give the center just a hint of yellow coloring. The frame at the top was created by cutting off the top of the Tag Sale #3 die cut and attaching it to the card front with pop dots. There will be LOTS of cards to see today with TONS of inspiration!! To add yours or to see all the participants, visit Nichole's blog here!! Thank you so much for stopping by!! I am off now to view the other cards in the hop!! Hi!! I have a card today that I made back in July at our last Stamping Away weekend! It uses the beautiful Mehndi Medallion stamp set!! I LOVE that you get so many fabulous images in a set that costs only $5! I pulled out one of my favorite, stand-by color combinations too! I stamped the images on a white piece of cardstock and then ran that piece through my Big Shot with the Linen Impression Plate. I love adding just the little bit of texture to the card! It really does make all the difference in the world! I popped that section up with pop dots and then, of course, I finished it off with my favorite twine from none other than The Twinery! I hope you all are doing well!! Thank you for stopping by!! Hello everyone!! I have a post up over on The Twinery's blog today and wanted to share it with you as well! For today's project I wanted to share with you something I put together for my son's birthday. This was based on one of the most creative pieces of mail I have ever received!! I think I gasped when I received it and then immediately thought about how I could use that same idea some day...and I did! So, what did I receive? It was a plastic bottle with a message inside! How fun!! I took that same concept and created a gift for my son. Mason loves to get money so that he can buy the toys he's been eyeing. I didn't want to just give him the cash for his birthday, I wanted a fun way to package it too, so this was the perfect way to do that! This is what the gift looked like when I finished with it. I"ll tell you a little bit about what is inside the bottle first and then I'll show you some more detailed photos. I created a little note to put inside the bottle. I used the same quote that was on the message that I had received in the mail because it was so cute. I created this in Microsoft Publisher and put it way at the top of the page so that when I rolled it, it would be on the outside of the scroll. Here is a closeup of the top. Subway art is so popular right now and the look is so fun that I decided to create a print on the back of the scrolled note with a birthday message for my son, Mason (it was about time to change some of my ink cartridges so there are some lines in it). Rolled up along with this note was the birthday money so when he unrolled the scroll, not only did he get the birthday message, he also found the money! On this picture you can see the message on the scroll that is rolled up. I had to roll it up really, really tight so that it would fit inside the opening in the bottle. To allow the scroll to be pulled out of the bottle without spilling the sand and seashells out, I first rolled the scroll tight and attached rubber bands on the ends to hold it in place while I tied the new Denim twine & Maraschino Twinery twine tightly around the center. I left the ends of the twine really long. On the part of the twine that would be in the bottom of the bottle, I cut it so that it would fall right to the bottom of the sand. I then inserted the scroll into the bottle keeping the other end of the twine outside the bottle and then pushed the cork in to hold the twine in place. I tied a key charm to the twine (which can be purchased at a craft store) that would allow Mason to pull on to get the message out of the bottle and then I cut the twine to the length I wanted. This is what the bottom of the bottle looks like. It has a little bit of sand and seashells in it. I unraveled the twine slightly to make it look more roughed up. So much fun! I also wanted to continue the "earthy" theme on the outside of the bottle too but not overdo it since it was suppose to look like it had washed up on shore. So, I wrapped a little bit of the new Buttercream twine around the outside and tied it in a knot. No pretty bow either. Just a plain knot. Remember, it washed up on shore, lol!! I also found that places like Hobby Lobby sell plastic bottles in various shapes for sand art. Most of these seem to come with a plastic cap but you can buy cork toppers separately. Of course if you aren't planning to mail this, glass would work great too and you can find those at many of your large craft stores as well! I hope that you enjoyed this project and that it inspired you! Did you enjoy The Twinery's Anniversary Celebration last week!! It was a lot of fun for me to hop around and see all of the cool projects made using The Twinery's fabulous twine! If you didn't get a chance to hop, you can still see all of the projects made by visiting the links on The Twinery's blog (just scroll down a bit to find the Echo Park Paper & Scorpal blog hop threads)! The prizes have already been given out, but there is plenty of inspiration waiting to be seen! Thank you for stopping by today!! I'd love to hear if you make one of these projects! Have a wonderful day! Hey!! I hope you all had a wonderful weekend! It sure goes fast doesn't it!? Today is a hard day for a momma. 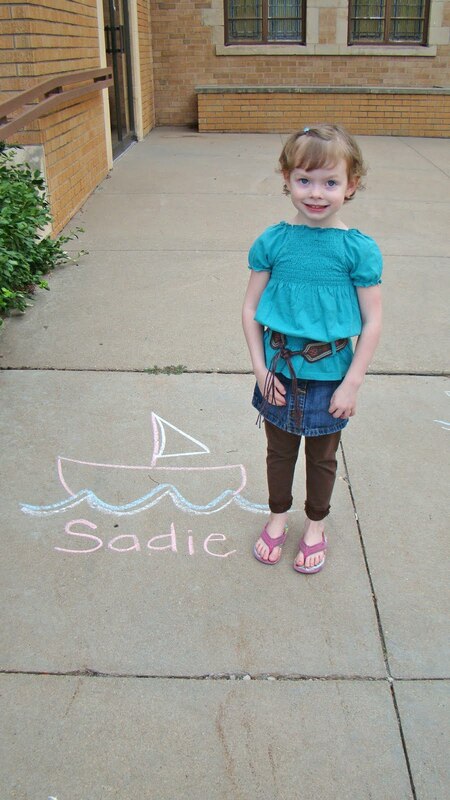 It's Sadie first day of Preschool. Wow. I thought I was ready for this day...even looking forward to it! But the house is so quiet now. Too quiet. It's weird. And sad. My baby girl is growing up fast! I have to admit I'm struggling a little. Ok, a lot! :) I think the flood gates could open at any moment! But even as I am typing this, I realize that I pick her up in just 45 minutes and things will be back to normal. I'll probably just squeeze her a little bit tighter and give her extra kisses this afternoon! I wanted to share another Lil' Inker Designs Rainbows & Clouds card that I made. I wanted to use very rich, non-traditional colors for this card. Have you ever seen a Fall rainbow? I'd say that this qualifies for one :) I used the stairstep look similar to what I did on this card except this time I just staggered where the rainbow started to make a full rainbow. At each section, I popped up the part that would be on the left side of the rainbow with pop dots and then layered the other end flat against the card. I continued to do that until I came to the last layer. After I had assembled the entire rainbow, I took my clear glimmer mist and sprayed it to give it a shine. It adds a fun effect to the rainbow. I also sprayed the sentiment strip as well. So, I just have to ask! Have you purchased the Rainbows & Clouds set yet? If not, head on over! I LOVE, LOVE, LOVE this set!!! Isn't that sentiment cute too? That is included in the Rainbows & Clouds stamp set!! Welcome to the last stop on the Twinery's Anniversary blog hop! We are so glad you could join us for the 1st Anniversary Celebration blog hop with The Twinery & Echo Park Papers. If you came here by way of Tamara Tripodi's blog, you are on the right track! If not, be sure to start at the beginning over at The Twinery's blog because there are terrific prizes for those who complete the hope by commenting on each blog. You'll have two days to enjoy this hop, so have fun! You might be wondering what is up for grabs! 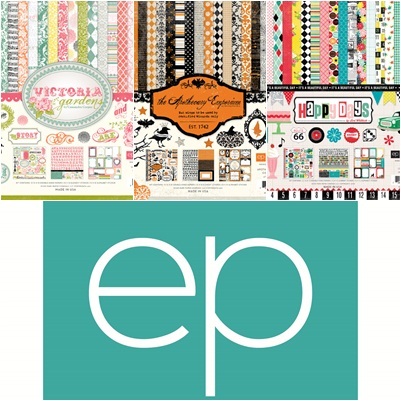 3 Paper Collections from Echo Park Paper! To be eligible to win, just leave a comment on each blog in the hop! Good luck! For this blog hop I wanted to make a fun gift set. I used the "Summer Days" paper pack by Echo Park. I love, love this paper! Did you know that you can get this in 12x12 size or a 6x6 size pad? The die cut stickers and the tags I used on the bag and the gift are both from the 12x12 pack. They are SO FUN!! Here's a closeup of some of the details on the gift set. I used the Twinery Twine on my bag to tie the ends on the banner at the top, to tie the tag onto the bag and to tie a bow around the tag. And here is the gift inside the bag! I made a belly band around the tin and tied 3 strands of twine around it. I used Lilac, Lemondrop & Caribbean twine. Every inch or so I tied a knot in the twine to add some interest. This is a view of the back and you can see the knots I tied better. I also stitched twine around the outside of the sun. I love how this looks on the tag! Are you wondering what is inside that tin? 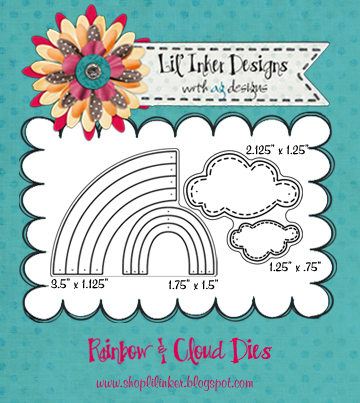 It is a set of mix & match rainbow & cloud magnets! I die cut Echo Park paper & magnet strips with rainbow & cloud dies and then glued the pieces together. (I cut the paper & magnets separately because the sandwich was too thick otherwise). I cut several different patterns of each type of shape so that the recipient could mix & match to her heart's content! Here are a few of them on the front of the refrigerator! My 3 year old daughter insisted that we had to make clouds with the ice cream cone paper! She helped me die cut these and had the best time "helping" and offering advice! :) So if you don't give this as a gift, it is a great activity to make with your children! Thank you so much for stopping by today! I hope I've inspired you! Please make sure you leave a comment on my blog to be eligible for some fantastic prizes! The deadline for commenting is 11:59pm EST, Friday, August 19th. Prizes will be announced on Saturday, August 20th on The Twinery's blog. Hi everyone!! Have you heard about The Twinery's anniversary celebration? It's all this week!! Today there is a blog hop with The Twinery and Scor-pal so be sure to check that out! And Thursday be sure to come back and visit my blog when we hop with Echo Park Paper! This week school begins for my kiddos. Since I have school on my mind a lot lately, I wanted to share a project I made that would be a great teacher gift! 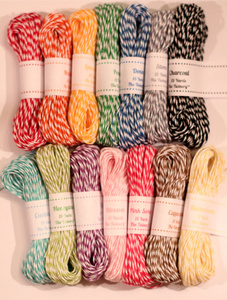 I used a lot of Twinery twine and some great products by Lil' Inker Designs!! 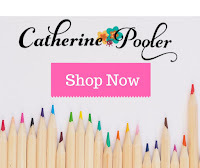 It is a gift set that includes a card, a fun envelope and a colored pencil jar! I'll start with the card. I used 2 colors of The Twinery's fabulous twine around the center of the card and used 3 colors of twine to tie around the ribbon on the tag. Perfect colors for school related themes! The school themed paper came from Hobby Lobby. I used Lil' Inker Designs "Sentiment Flags" dies and stamps to make the bottom part of the ribbon and the sentiment comes from Rainbows & Clouds stamp set. I really love how the envelope turned out! 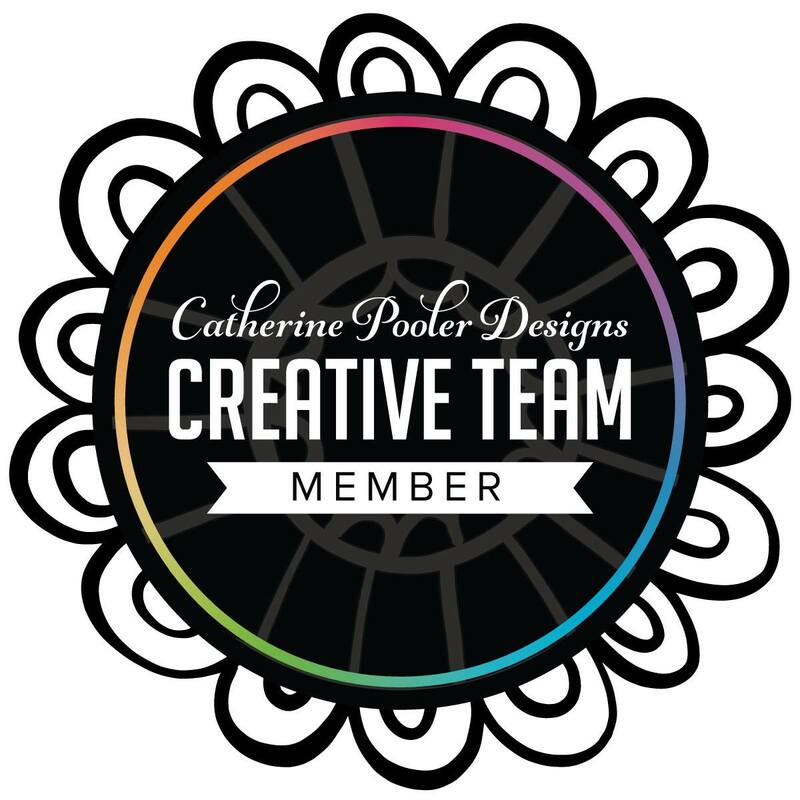 I made a pinwheel with Lil' Inker Designs Pinwheel die. For this one I made it a little bit different so that I could attach it with a thumb tack to the pencil and so that it could also spin (more about that below). I created the long banner in the middle of the envelope by folding a piece of cardstock in half and cutting with the Lil' Inker Designs' (LID) Flag Sentiment die with the top part of the die hanging off the edge of the cardstock. Then I stamped the flag image twice. I attached the pinwheel with the twine which covers up the fold in the middle of the banner. To make this jar/vase I cleaned out a soup can (opened with a smooth edge can opener so that there weren't any jagged edges). I then hot glued the pencils (which you can buy super cheap right now!!) around the can (I didn't have mine quite close enough together so my last one didn't lay flat so be sure to push them together as close as you can!). Then I added Denim, Lemondrop & Maraschino Twinery twine around the outside and used a couple of pop dots to attach the pinwheel to the front. Here's a fun view of the can! Thanks for stopping by today!! Be sure to visit The Twinery's blog to check out the giveaways going on AND the blog hops this week! 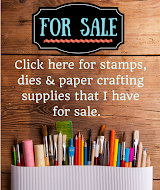 Also, check out Lil' Inker Designs store to grab your very own dies and stamp sets! !